Yea I'd love an invite. If I could get one, that would be great thanks. Whelp, didn't know this. No wonder he seemed to side with a poster with #gamergate in his bio, who I had an argument with way earlier. I think I shared that story here too. The podcast should be interesting this week. Thanks for your patience, invites are slowly going out. We don't want to take any unnecessary risks. So as not to take forever dishing out individual invites, if you would like to be invited, just add and message 5[SPOILE[/SPOILER] on Discord WITH your GAF name, and we'll go from there. I'd like an invite too. Thanks! I think this would probably go more smoothly if some of us posted their Twitter handles to get around the PM limitations. My handle is @jhakai . Thanks. Just letting y'all know since it's getting late where I am that there are a few mods helping things get started over at the EZAGAF discord and we are vetting people to make sure they aren't trolls and sending out DMs. Obviously it might take a minute with the limitations but it's being handled. Want have a place to go to with jolly discussions. Can I get an invite as well well? So this discord server is new and different to the already existing EZA one? Thankfully yes. Just popped into the EZA discord for the first time ever and immediately saw someone call a character they thought was a girl a "trap." Not what I was expecting in an EZA channel. I would love an invite! I'm going to miss y'all. I still haven't decided if I'm going to continue lurking here or not, but I have read this thread every day since the beginning. The original Final Bosman thread got me into GT and I've been along for the wild ride ever since. Thank you for all the laughs and memories. I'd rather we move to that new place, "the button on retro consoles that isn't power" "another word for age." Edit: Turns out it's not specified who's behind that beyond "ex-gaffers." But for now a Discord invite would be nice. Could I get a Discord invite please? Axass already sent me one whilst I was asleep but its expired so if someone could send me another, thatd be great. Thyvan makes art work for EZA. Prominent people in this community are very questionable. This is why Im more interested in a GAF EZA discord. 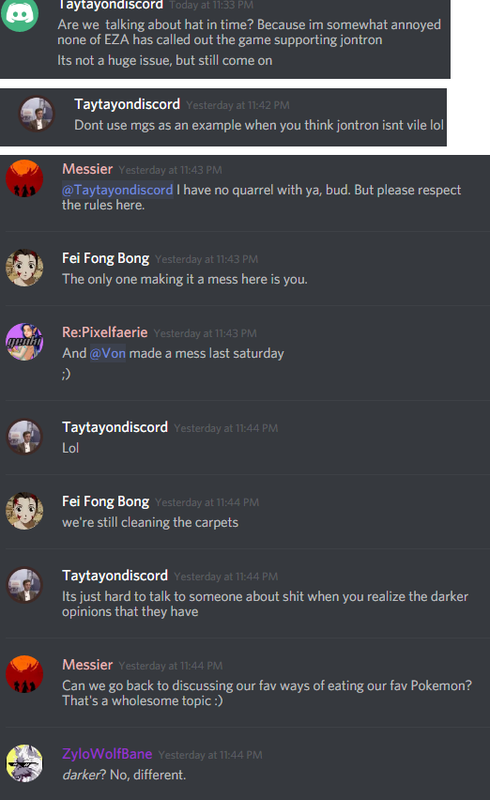 Normally, Id think it were counter productive to create a separate discord but Ive been hopping in and out of the main discord for the last few days and theres always snarky comments about GAF members drifting in to the Discord and how the Mods are going to be strict with them (which is funny cause the OP of this thread has been in it longer than most of them). Plus, Ive seen their moderation first hand on both discord and Twitch and id rather not have to deal with their GAF is the dark side of the internet mentality. Especially if one of thems a gator anyway. I'd love an invite to the gaf eza discord too. I don't think I'll be sticking around this forum, but the community here was one of the highlights for me. L&R. ...This is really upsetting, and not what I would expect from the official EZA forum. Franklin James blow them all to hell. Looking for an invite. ty! Hey, I've been following EZA for awhile but never really part of the GAF community. Now that all this nonsense has happened I'd like to have a few groups I can drop in on, so I'd really appreciate an invite, thanks! Quoting this just in case. Didn't know we should quote this, but yeah, would love an invite! Hey Allies, requesting an invite so we can vacate this sinking ship together. Im ready for a clean slate. Count me in, Lycan. Discord link for me as well please! I'd like an invite as well please. I don't post in here but I lurk here and keep up with EZA content regularly.